PTSuks Uncanny World: Mis-Adventures in "PUBG - Player Unknown's Battlegrounds - Winner! Winner! Chicken Diner!!!" 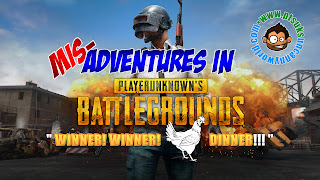 Mis-Adventures in "PUBG - Player Unknown's Battlegrounds - Winner! Winner! Chicken Diner!!!" Affiliate Links - They really help out the channel at no cost to you! Hope you enjoyed this post! If you did, don't forget to give it a like, thumbs up, or +1, leave a comment or two, and SUBSCRIBE so you don't miss any articles and Videos! You can also follow me on the various social media sites, where I typically post tidbits, previews, and other items that might not encompass a full blog post or full length video. I also sometimes put up info on upcoming activities, live streaming events, Q & A's, or just the day to day musings!